People with disabilities have shared accounts of the online abuse they face, after MPs backed a petition by model Katie Price calling for new laws. More than 220,000 people signed reality TV star Ms Price’s petition to make online abuse a criminal offence. 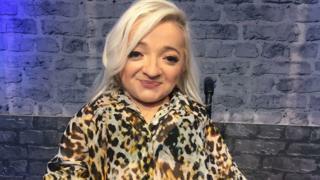 Actress Samantha Renke, who has brittle bone disease, said she received social media messages calling her “vile” and saying “real humans walk on two legs”. “It’s most certainly affected my mental health,” she told the BBC. 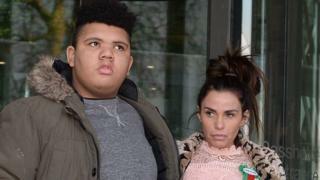 Ms Price – who used to be known as Jordan – created the petition after raising awareness of the trolling that her son Harvey, who has disabilities, received. Now MPs on the Petitions Committee want to give disabled people protection under hate crime laws. The politicians said self-regulation of social media “has failed disabled people” and internet giants must also “accept responsibility” over abuse. “Harvey’s experience is not unique,” said Labour MP Helen Jones, who chairs the committee. “Social media is rife with horrendous, degrading and dehumanising comments about people with disabilities. Ms Renke, who is also a disability campaigner, told BBC Radio 4’s Today programme: “When I did a well-known commercial I had this influx of abuse online mostly on platforms such as Twitter. “It came as a real shock to me as I never experienced that in real life. And all of a sudden I was being targeted not because people didn’t like my personality but specifically because of my disability. “They are saying ‘oh my goodness what is that. She is vile. She makes me feel sick. Real humans walk on two legs’. They’re the kind of more milder ones. She added: “For those who say just ignore it, sticks and stones, words don’t hurt you. Actually words can affect your mental health, it’s most certainly affected my mental health. Kevin Healey, who has autism, received disability abuse on social media and quit Twitter for a while to avoid it. “They [abusers] were cloning my Twitter account and pretending to be me and impersonating me,” he told the BBC’s Victoria Derbyshire show. Ms Price, a mother-of-five, told the MPs in evidence that “the most horrific things” had been said about 16-year-old Harvey, who is partially blind, autistic and has the genetic disorder Prader-Willi syndrome. On Tuesday, she tweeted that she was pleased MPs had backed her campaign. Unlike race and religion, there are no specific disability-related criminal offences. Instead, if the offence was motivated by disability, the sentence for the crime can be increased. The committee of an MPs launched an inquiry in response to the petition, which was closed early due to the 2017 general election. Last year, the then Digital, Culture, Media and Sport Secretary Matt Hancock said he did not have enough power to police social media companies, after admitting only four of 14 invited to talks had showed up.